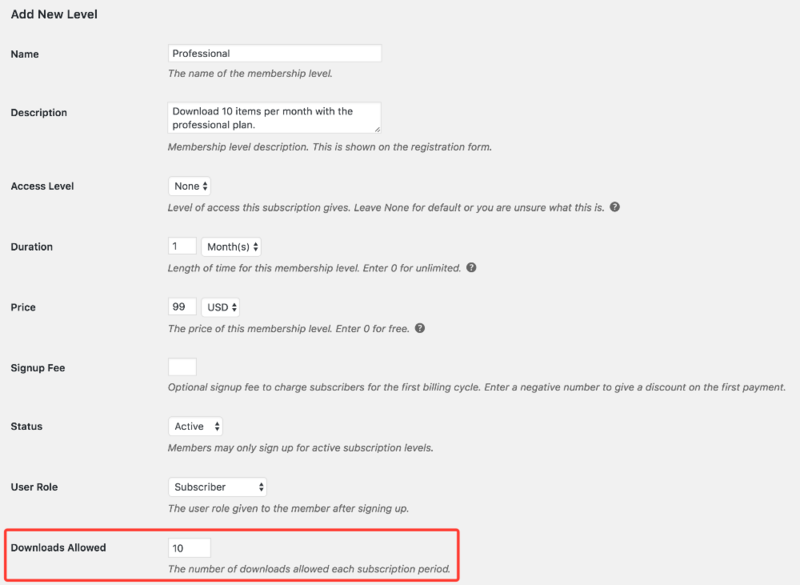 The Easy Digital Downloads Member Downloads add-on for Restrict Content Pro lets you offer subscription plans that give your members access to a specified number of free downloads based on the subscription level the member has. This is useful for sites that want to offer products to their subscribers for free while they have an active membership. One example is a stock photography site. This add-on requires Restrict Content Pro and Easy Digital Downloads. Easy Digital Downloads Member Downloads must be enabled on the subscription levels whose members you want to have free downloads. To do that, go to Restrict > Subscription Levels, add a new subscription level or edit an existing level, and enter the number of downloads allowed for that subscription level. See the screenshot below. That's all there is to setting up the plugin! Everything else is handled automatically. If a member with a download-enabled subscription visits an EDD product page, the Add to Cart button will turn into a Download button to indicate to the member that the item is available for download. When the member clicks the Download button, the file attached to the product is automatically downloaded. Behind the scenes, a payment is recorded in EDD for the amount of $0 and added to the member's account. A note is added to the payment record to indicate that it was created due to the member downloading the item allowed by their membership. See screenshot below. Why is a payment recorded? Because Easy Digital Downloads protects files attached to a product, based partly on the payment details. This payment data is used to construct a secure link for the member to download the file. This also allows the member to later download the file again, if needed, from the Purchase History page created by Easy Digital Downloads. It also gives you and the member a record of the products downloaded. What happens when a member reaches the download limit? The regular Add to Cart button is shown, allowing the member to purchase the product if desired. What happens if a member expires? Do unused downloads carry over into the next period? What happens when a member renews the subscription or the subscription automatically renews? The download count is reset for each subscription period. For example, if a subscription level is set up for a 1 month duration, and the subscription level allows 10 downloads, that means the member can download 10 items per month as long as he or she has an active membership. Does it support EDD product bundles? Does it support EDD variable price options? How can I display how many downloads the current member has left? This can be done with a shortcode: [rcp_edd_member_downloads_remaining] This will display the number of downloads the currently logged in user has left in the current period.